November 2, 2005 - by The Editor - 2 Comments. 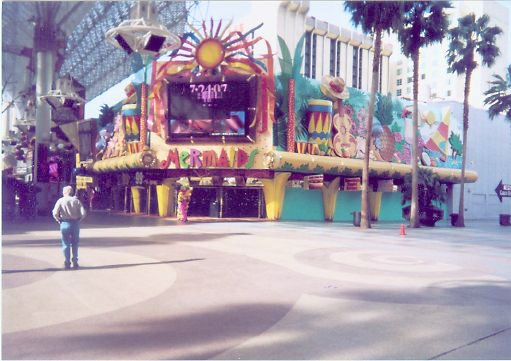 This is a picture i took of Mermaids casino downtown on Fremont Street. This is a small slot casino with no table games or hotel. Out front is usually two girls with Carmen Miranda style headresses shouting for people to come in; Sometimes an Elvis impersonator joins them, you can take pictures with them but there main job is to try to get you in to the casino. I must tell you the slots in here i real tight and i have never seen people win much. My suggestion if you go in this casino is to go right through to the back of the casino where they have a small bar that has cheap beer specials and deep fried twinkes and oreos if you are feeling daring.